WHEATLAND, Calif. — The Central Valley was once one of North America’s most productive wildlife habitats, a 450-mile-long expanse marbled withmeandering streams and lush wetlands that provided an ideal stop for migratoryshorebirds on their annual journeys from South America and Mexico to the Arcticand back. Farmers and engineers have long since tamed the valley. Of the wet landsthat existed before the valley was settled, about 95 percent are gone, and thenumber of migratory birds has declined drastically. But now an unusual alliance of conservationists, bird watchers and farmers have joined in an innovativeplan to restore essential habitat for the migrating birds. 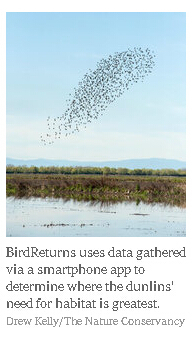 The program, called BirdReturns, starts with data from eBird, thepioneering citizen science project that asks birders to record sightings on a smartphoneapp and send the information to the Cornell Lab of Ornithology in upstate NewYork. By crunching data from the Central Valley, eBird can generate maps showing where virtually every species congregates in the remaining wetlands. Then, by overlaying those maps on aerial views of existing surface water, it can determine where the birds’ need for habitat is greatest. 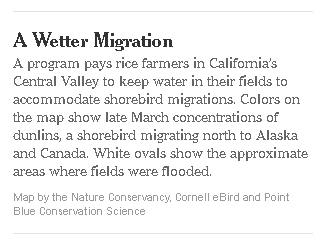 The BirdReturns program, financed by the Nature Conservancy, then pays rice farmers in the birds’ flight path to keep their fields flooded with irrigation water from the Sacramento River as migrating flocks arrive. The prices are determined by reverse auction, in which farmers bid for leases and the lowest bidder wins. Because the program pays for only several weeks of water instead of buying the habitat, the sums are modest; the conservancy does not disclose bidsbecause that might affect future auctions, but it says the figures were bothabove and below the $45 per acre that the federal government pays forbird-friendly practices. The project’s first season ended last month, as birds headed north fromnewly flooded fields. Researchers said all of the birds whose numbers theyhoped to improve were seen on “pop up” wetlands — a temporary steppingstone forthe birds’ journey north. This happened when the field would have ordinarily beendrained, an indication that the approach was working. More analysis will bedone this month. The fields will be flooded again in the fall for the birds’return journey. 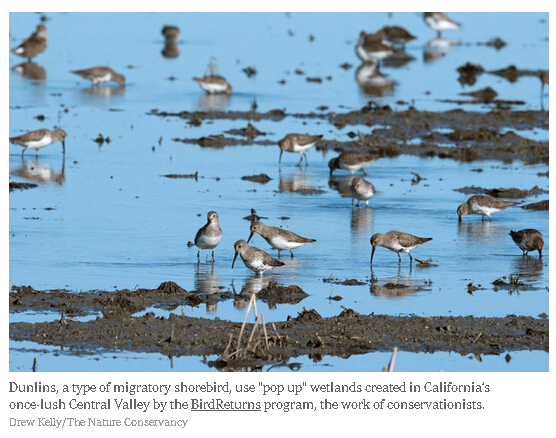 Eventually, using this and other approaches, the conservationists at BirdReturns hope to increase the number of shorebirds thatstop in the Central Valley to 400,000, from current levels of 170,000. BirdReturns is an example of the growing movement called reconciliationecology, in which ecosystems dominated by humans are managed to increasebiodiversity. “It’s a new ‘Moneyball,’ ” said Eric Hallstein, an economist with theNature Conservancy and a designer of the auctions, referring to the book andmovie about the Oakland Athletics’ data-driven approach to baseball. “We’redisrupting the conservation industry by taking a new kind of data, crunching itdifferently and contracting differently.” It could also be an exportable solution. Agriculturecreates some of the world’s most serious ecological problems. If BirdReturnsproves itself, it could be an inexpensive model for adjusting agriculturallandscapes to mesh with the needs of wildlife. The shorebirds — among them dunlins, sandpipers, snipes, whimbrels andblack-necked stilts — zoom into wetlands, and wade on stiltlike legs through a few inches of water or across glistening mud flats to ferret out worms,insects, crayfish and snails with their long bills. The Central Valley is the most developed of the landscapes they cross.Until now, one of the biggest problems has been that in February, at the peak of migration, rice farmers are letting their fields dry out in preparation forplanting. “When they need it most, there’s less and less habitat,” said MarkReynolds, a Nature Conservancy scientist who helped design the program. In 2012 Dr. Reynolds and Brian Sullivan, the eBird project leader for the Cornell Lab of Ornithology, got the idea of using the sighting data to find outwhere the shorebirds go. They overlaid those data on maps of water availabilityin the Central Valley to determine where the needs for wetlands were greatest. The ideal depth for shorebirds is two to four inches of water; any moreand it is too deep for foraging. When eBird data show that a migration isunderway, rice growers who have entered low bids open their irrigation ditchesto provide just the right amount of flooding. That results in the pop-upwetlands. In this first year, 10,000 acres (out of 500,000 devoted to rice farmingin the Central Valley) owned by 40 farmers were flooded for four, six or eightweeks, at an average of 200 to 250 acres each. 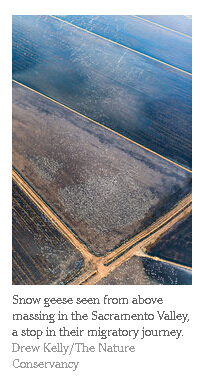 (Many farmers did notparticipate because of California’s drought.) Even for farmers who have enoughwater, the program can require some careful calibration. “If we put our wateron late, the fields might not dry out” in time for planting, said Doug Thomas,who grows sushi rice for Rue & Forsman Ranch near here and who took part inthe program this year. But he added that the compensation was better than adequate and that heliked the private-sector nature of the initiative. Chris Elphick is an ornithologist and conservation biologist at theUniversity of Connecticut who is familiar with the program but not involvedwith it. He called it “a great project,” though he cautioned that it was toosoon to tell how well it would work in the long term. The sponsors are optimistic. On a recent rainy day here, thousands of soaring dunlins wheeled across the gunmetal sky in the cohesive flockchoreography known as a murmuration before they set down in a soggy rice field.